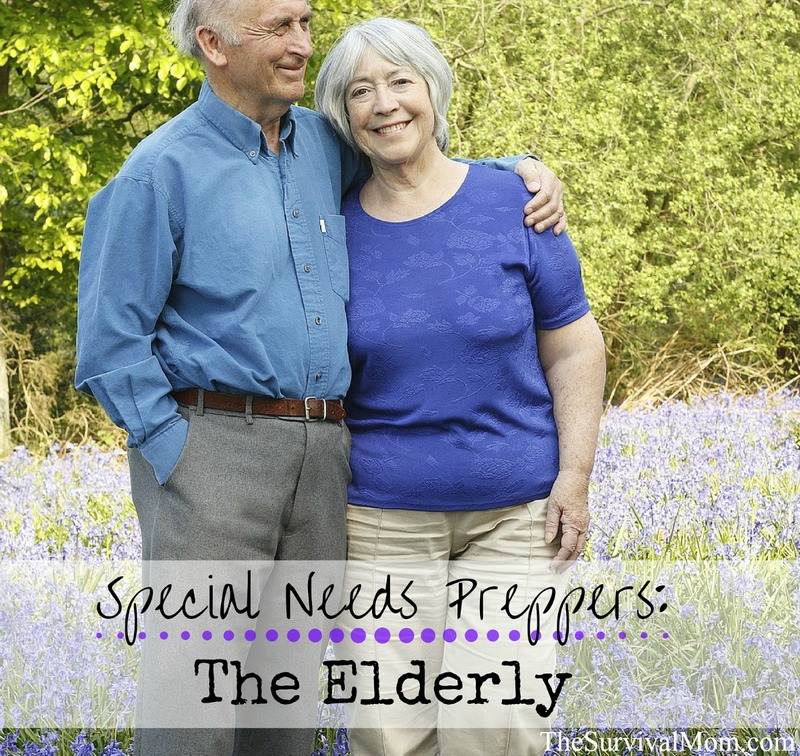 When it comes to prepping, age-related needs come at both ends of the spectrum. Small children and elderly parents can have very specific needs because their bodies just aren’t able to self-regulate the way a healthy adult in the prime of their life does. Elderly preppers have unique needs to take into consideration. Even when the needs are the same, such as pureed food or diapering, they have to be approached differently when it’s an elderly person with a lifetime of being independent, or even an adult who has been dependent their entire life. They either have memories of not being this way, or they know other adults are not like this. It’s important to never make them feel like they are being made fun of for something that is beyond their control, whether that is a physical or mental attribute. Most people can retire when they are sixty or sixty-five and that’s a reasonable time to start asking more questions and thinking about putting some preps in place for your parents and other older relatives, although many are still quite healthy and spry well into their 60’s and beyond. Initially, simple steps like having a copy of their will, medical Advance Directives, such as a DNR (Do Not Resuscitate), and other basic forms and information is probably sufficient. As time goes on and takes more and more of a toll, you will need to take more steps to help them, but this is normally a gradual process over a period of a decade or more. In addition to Advanced Directives/DNR for the state they live in, it’s a good idea to have one for any state you reasonably expect the to visit or travel through. (DNRs are different in different states and specify what should be done in a medical emergency in terms of pain medication, feeding, and life-extending measures.) Of course, also have copies of any prescriptions and diagnoses they have, and a complete list of all their doctors’ names, addresses, emails, and phone numbers. A HELPFUL TIP: Create a Grab-n-Go Binder for your elderly loved one. It should be stored in an easy-to-find location and you should have copies of its contents scanned and stored in the Cloud or on a thumb drive OR have hard copies in your own binder. Just because your elderly prepper is well enough to stay in their own home, doesn’t mean they will take care of emergency preparedness items. After all, most young people don’t either. Even small amounts of mental deterioration may make it hard for them to realize how dangerous certain situations are and what they need to do to be prepared, and sheer stubbornness may lead them to deny obvious danger signs. There are certain emergencies most people are prepared for. Almost everyone knows the importance of smoke detectors and being prepared for a fire. Depending on the location, preparing for earthquakes, hurricanes, tornadoes, and other natural hazards may be nearly as common place. These familiar events are a good place to start if the idea of prepping is new to them. Let’s face it. It’s a lot easier to talk about preparing for a tornado than bringing up topics like bug out bags and how they can handle two weeks without access to medical care or their prescriptions. Smoke detectors are very nearly universal in all homes. Some, like the one linked in the last sentence, play a recorded message so you can direct family members what to do and where to go in a fire. Forgetting to check batteries in smoke detectors is almost as universal as owning them, so go ahead and do this when you visit elderly loved ones. They may find them hard to reach on their own, and testing the detector is also a good way to be sure they can still hear it. If they can’t, it’s time to switch to one with a strobe light. We have emergency ladders to get out of every bedroom in our house in a fire. If your parents have one, can they still safely climb down it? If they fall, how hard is the surface they will land on? Even if they can still safely climb down, you need to make sure they have a safe area under their window in case they fall to minimize the chance of breaking a hip or other bones. A bucket of just-add-water meals to provide food for a week or more. These meals are very lightweight and as long as your loved one can heat water to boiling, this food will provide the nourishment they need. Large print road map. If the are still able to drive, this will be a huge help. Waist pack, formerly “fanny pack”, to make sure they always have certain items with them, no matter what. Small LED flashlights in each room. Velcro these to tabletops or other handy locations to make sure they don’t easily get lost. Fashionable reading glasses, for the ladies. A Kindle loaded with books, both for entertainment and reference. It’s easy to change the font size, so this really is a must-have for anyone with vision issues. You can also talk about the need to improve their tornado/hurricane/earthquake/whatever preps. Even if they aren’t open to all your suggestions, they are still adults and you need to respect their choices, even ones you know aren’t smart, as long as they aren’t endangering anyone else. Once your relatives can no longer care for a yard or remove snow from the driveway and sidewalk, it is probably time for them to move into a senior apartment, particularly if no one lives close enough to help. Their emergency preparedness needs will change when this happens. For example, even if they can still use an emergency ladder, it is time to replace it with something less physically taxing. Part of moving from a home to an apartment is downsizing. They will have to get rid of a lot of stuff, some of which may be useful to you in your preps. Items I bought from an elderly woman moving into assisted living included wool throw blankets, high-quality hand-powered kitchen gadgets, cigarette lighters from back when they were daily use items, and really good gardening tools. We all collect more stuff than we need, and your loved one may need help in sorting through their own household goods. If possible, and if there’s an urgent need for cash, help them organize and hold a yard sale. With downsizing, it’s a good time to review their paperwork. Some of their doctors may change when they move, so be sure to check their list of doctors both right after they move and a few months later, when they have settled in a bit more. It’s possible you may be the one to seek out new doctors, so be ready to ask for referrals and do some research in order to find the best care in this new location. Sometimes transportation can become an issue at this stage, and that is something to keep in mind as new doctors are found. In an emergency, elderly loved ones who are living on their own, should be able to pack for an evacuation, but will almost certainly need a list to work from. Create a list with them (in a large font! ), post 1 or 2 copies in handy locations, then review it with them every six months or so to keep up with their health. You don’t want to have their cane on the packing list, only to end up at your destination and find that they are struggling without their walker. Put the list inside a plastic sheet protector with a dry erase pen and a facial tissue. The dry erase pen can write on the sheet protector, and the tissue can be used to wipe it off, making the packing list reusable. 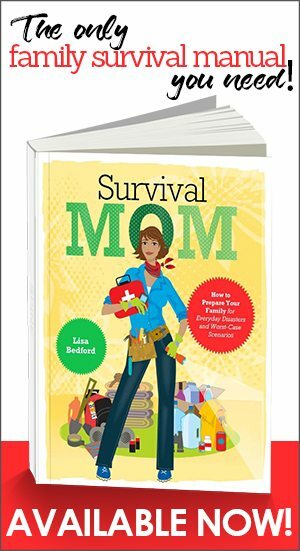 TIP: The Survival Mom has written an entire, easy to read manual on the subject of Emergency Evacuations. When their condition deteriorates to the point that they can’t live on their own any more, they will need to move into assisted living. This option is for people with most of their abilities to live independently intact, just not enough to be on their own, to those with no ability to care for their daily needs. This move will also lead to another round of down-sizing. Whatever their condition, an elderly person should be able to pack their own bag, or direct someone else to pack it. Some may need to have a very detailed checklist to follow while others may only need to be told “pack enough clothing for at least a week” and they will have everything they need, including toiletries, spare shoes, and sunscreen. You need to evaluate your loved one’s condition and give them the support they need to successfully pack themselves. You should already have copies of all their prescriptions and diagnoses. Now it’s time to find out what medical equipment, if any, they will need. In this move, they shouldn’t need anything too large or expensive. The largest thing someone in assisted living is likely to need is an oxygen tank or wheelchair and keeping one or two spare tanks of oxygen handy. These don’t take a lot of space. Honestly, I have that much space dedicated to shoes I rarely wear. Assisted living residents can also have their own bug out bags assembled and ready to go. These should contain copies of all the paperwork discussed in the last paragraph. By the time your elderly loved one is in a nursing home, you can’t count on them doing anything to help themselves in an emergency. At most, they will be able to pick up and carry their own emergency bag. Realistically, most people in a nursing home will be hard pressed to hold onto a bag while someone else pushes their wheelchair to the exit. You will need to have everything ready for them. Unlike a person in their own home, their room will contain very few personal items. They will have downsized as much as they possibly can and are unlikely to have anything substantial beyond clothing, toiletries, and a few small items. You won’t need to have clothing pre-packed because you can take a bag and empty their drawers/closet into that bag as you are getting ready to leave. You can clear out the medicine cabinet/bathroom sink into a toiletries bag, making sure you have all their key medicines. The upside of having few belongings is that it takes only a few minutes to pack them up. TIP: Prior to this move, be sure you have had discussions regarding personal belongings, real estate, and finances. You should already have copies of their key paperwork and medications (discussed above). At this stage in their lives, you should ask their doctors and the nurses who oversee them on a day-to-day basis to find out what else they need. Will they need a bedpan, catheters, IVs, or other medical equipment? If so, you can buy those and have them ready in an emergency or at least be prepared to make arrangements as soon as possible after leaving the facility. Check frequently with facility administrators, nurses, and orderlies to keep up with any deterioration in their condition. An elderly woman I help care for complained of “some leaking” when she woke up in the mornings. When we eventually moved her out of her apartment, her mattress showed how much she had been in denial about her incontinence problems. This is something no adult wants to admit, but it’s all too common among the elderly. If there is a chance you will be evacuating or otherwise in the car for a long time, you should pack disposable incontinence underwear for them, especially if there won’t be easy access to bathrooms. 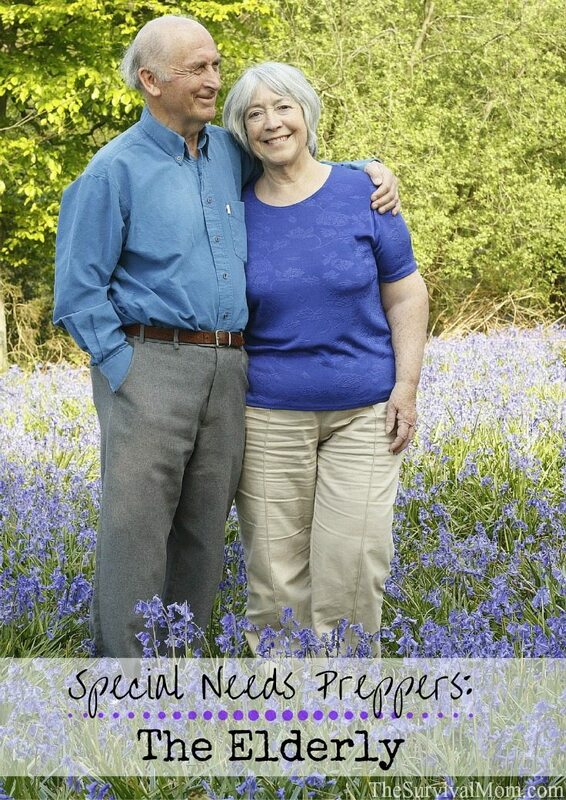 Incontinence issues affect many people of all ages. Before an emergency evacuation, tell the truth: You will be in the car for a long time and may not be able to get to a bathroom quickly. You have Depends, or some other brand, handy and let them make the choice whether or not to use them. If they are having problems, they will probably go ahead and use the Depends IF they can do it without being made to feel embarrassed or shamed. If they won’t do it for this reason, they probably won’t wear one for any other reason. 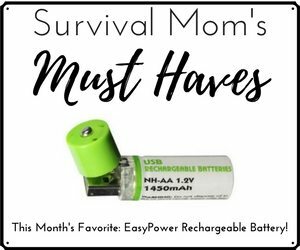 Special Needs Preppers is a complete series of articles for every family with loved ones whose needs have been overlooked by most other survival and prepper blogs and websites. Most of us can’t fathom leaving behind a pet — how much more important is a grandmother, autistic child, or a bed-ridden loved one? 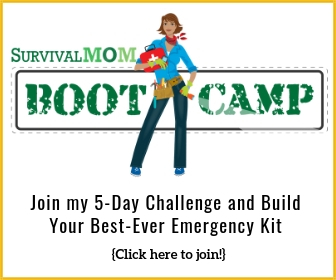 If you have other, helpful suggestions for any of these special needs preppers, please leave your comments. Liz, that was absolutely an informative article. Thanks for sharing the information. These are certainly the special needs for elderly preppers. Keep writing. Then I have an old fashioned diaper pail that I add maybe 1/2 c. distilled vinegar to the water, along with a bit of laundry detergent. Once or twice a day I rinse them out & hang on a clothes rack. The vinegar freshens ’em right up! Also, neither do I buy toilet paper! (Altho I do have some if I have company!) ;o) I got cheap wash clothes at Dollar General, cut them in 4ths. Red ones I use for when I just pee; otherwise I use a color I can put in bleach water, AFTER I have soaked them in the toilet water like I used to when I couldn/t afford disposable diapers for my baby. Just a token of the prepping I’ve been doing a LONG time. I’m also working on getting along without electricity as much as I can, like solar lights when nite lites no longer work. I just learned to keep pets cool by wrapping them in a wet bath towel. I have lots of mre’s, and when I empty a milk carton, I wash it out & fill it with water. When my kids come over they take ’em dow in the basement for me. I try to be as self-sufficient as I can. They have their own families. I live in pretty constant pain of arthritis in my lower back and knees; and I have a cat & small dog that give me lotsa joy & keep me moving. Interesting post. But there is a sub category of “elderly” people that is not addressed here. I’m talking about folks who are 99% as mentally sound as people in their 30s and 40s. They are not “infirm,” by most definitions. Some still have very good cardio, and decent strength. But their flexibility is diminished, their back, muscles, and joints are more prone to injury, and they no longer can engage in hand to hand combat with younger opponents, do extreme manual labor, or hike 15 miles a day carrying a 40 lb backpack. Gosh, I’m talking about me….and millions of other Baby Boomers. Could you give us some ideas about maximizing our strengths and compensating for our weaknesses? Harbour – I was going to comment with similar thoughts. As a baby boomer myself, it is shocking to be stereotyped as elderly and most likely infirm. Sure, we have some aches and pains, but that does not stop us. By the way, I can hike 15 miles a day with a 20 pound pack. For a smallish person of 5’2″, that’s not bad. When it comes to mental acuity? Let’s not even go there. You sound easily offended Gaye… I don’t think the article is talking about persons of your age that are still capable. As with anything, take what you can use and discard the rest. If the shoe doesn’t fit, quit trying to put it on. I’m not sure that Gaye was easily offended. She just pointed out that not everyone of retirement age or older is ready for diapers and nursing homes. I’m so glad we live in a country where modern technology and medicine help more and more of us live longer and healthier lives. Sorry, but we must quit taking for granted what we’ve known for so long! You should get as much extra meds while you still can. Our country is NOT what it used to be! It is GONE! That’s what Liz is trying to help us do…. …survive! You are describing my parents (in their 70s and 80s) as well! That’s the group I had in mind with the “First Steps” section. Even my mother-in-law was barely removed from that when I became her caregiver more than a decade ago. 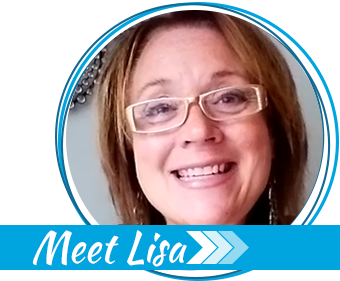 As Lisa noted, my experiences with her and watching her decline over the years are the main inspiration in writing this. There are lots of people in the prime of their life with physical fitness levels not that different from my parents, but you do make a good point that it would be worthwhile to cover. (For 70 or 80, they are very fit – someone who’s 40 and at the same level definitely has something else going on.) That could be another post later in this series. Wow! Me, too! I just sent Liz a lengthy email telling her what I have been doing. Hopefully you will be able to read it, too. I forgot to mention that I also got a solar laptop battery Stay charger so hopefully I can keep this thing going. I need to find out if I need to get a special solar rechargable battery for my laptop. Anybody know? Seems like I do. I don’t get out much but will try to remember maybe tomorrow, to stop into Radio Shack to ask. I don’t think we have long, the way things are looking. I would NOT want to be without my laptop! Stay close to home, away from stadiums full of people, etc. and stay safe! Wonderful article for those not familiar with the problems of aging! We wound up living with my grandmother for nearly a decade. In her 80’s, she was still able to look after her basic needs, but she moved slowly and was in the early stages of dementia. After trying in vain to coax her into the cellar during a serious tornado scare, we learned that we had to TELL her what to do during emergencies, using a brusque, no-nonsense voice. Once my son reached his late teens, we used him for that, because she’d grown up in the era of following the man’s lead. None of us are comfortable telling our elders what to do or making demands of them, but sometimes it’s the only option once they reach a certain point. That’s a great point! Thanks for sharing. I know my mother in law did NOT want to move into assisted living, but it wasn’t really a choice by the time she did. We told her it was coming for months while she tried to deny it (long wait list), but now that she is finally moved in, she’s happier than she has been since FDR was in office! It was hard to do, but as you noted, sometimes it is unavoidable. And good for your family for taking care of your Grandmother for so many years. If your elderly relative lives in a nursing home or in assisted living where they dispense medications, forget about getting their medications. It’s not going to happen. I think that depends on the circumstances. I would expect them to provide medication if an elderly person was removed from the home to, for example, go to a wedding or graduation out of town. They would supply the needed amount or the trip. Similarly, if there is a natural disaster barreling down on you, I can’t imagine they would prevent you from evacuating with them, and it seems like they would be found at the very least negligent if they refused to provide the needed medications for a short period of time. You couldn’t stock up on medication in advance, that is true, but you could be aware of what you need to make sure you have in an emergency. If the staff is rushed, they could easily make a mistake and you need to be prepared to double-check what they are giving you. You can also have non-prescription items ready to go for them. Loved loved LOVED this article. So much helpful information. The post just touched me deeply Liz, loved it. Thankyou for sharing. Loved the article – I’m rapidly becoming one of “The Elderly”. The last few years I’ve noticed a decline in my muscle mass, frequent bladder leaks, etc. Very informative.